After winning the 1984 Winston Cup Championship by 65 points over Harry Gant, Terry Labonte had established himself as a great driver. By the mid 1990’s, he was a consistent driver, who won a few races, but was never considered as a championship contender. That changed in 1996, where he pulled the biggest upset in Cup Series Championship history, beating Jeff Gordon by 37 points. After that, he was seen as a championship contender, until he retired from full time racing in 2004, though he raced until 2014. That same year, he was elected to the 2015 NASCAR Hall of Fame class. In 1995, Labonte’s 2nd year with Hendrick, he had a great season, with 3 wins, winning the 1995 Pontiac Excitement 400 at Richmond, the Winston Select 500 at Talladega, and the UAW-GM Teamwork 500 at Pocono. He had a consistent season with 14 top 5’s, and 17 top 10’s. During that season, one of his crew members wore this suit. 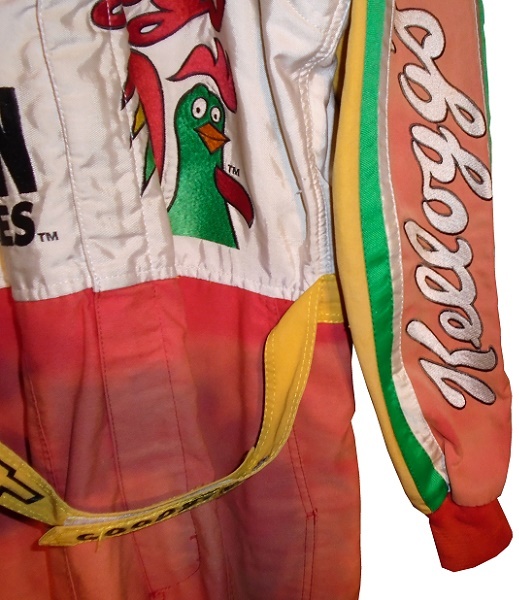 This suit may have been worn in 1996 as well. The suit shows use in the form of stains and there is a lot of sun fading, especially in the red. 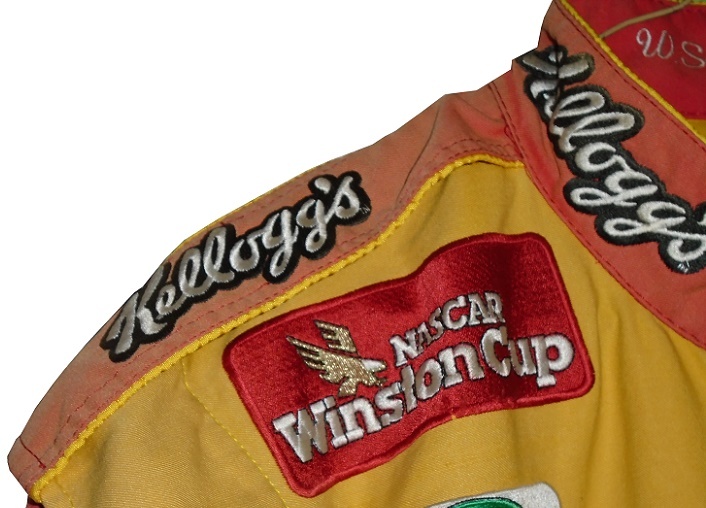 The collar is a standard collar, and has KELLOGG’S logos embroidered. 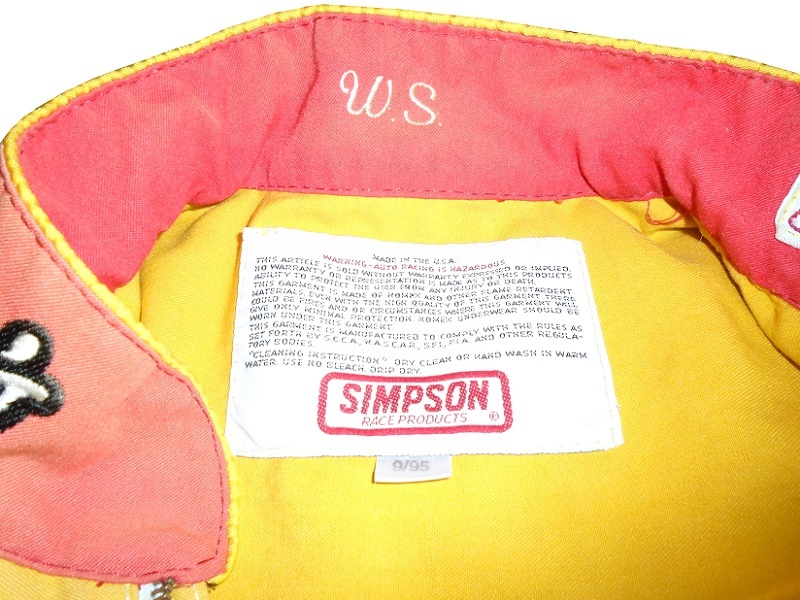 The collar has a standard Simpson warranty label, a small flag indicating the suit was made in “9/95.” The collar has the initials “W.S.” embroidered into it. The inside of the collar doesn’t show the fading the outside of the collar does, as can clearly be seen in this photograph. 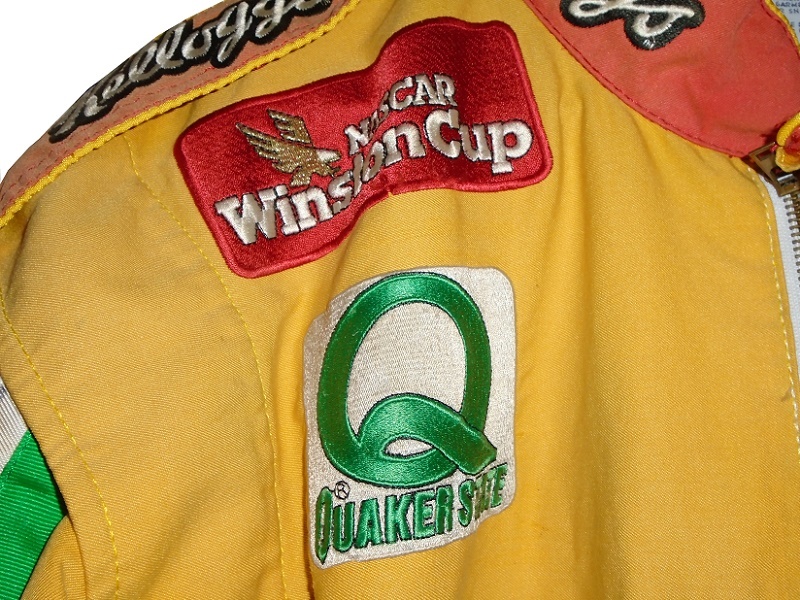 The right chest features NASCAR WINSTON CUP SERIES and QUAKER STATE logos embroidered into it. 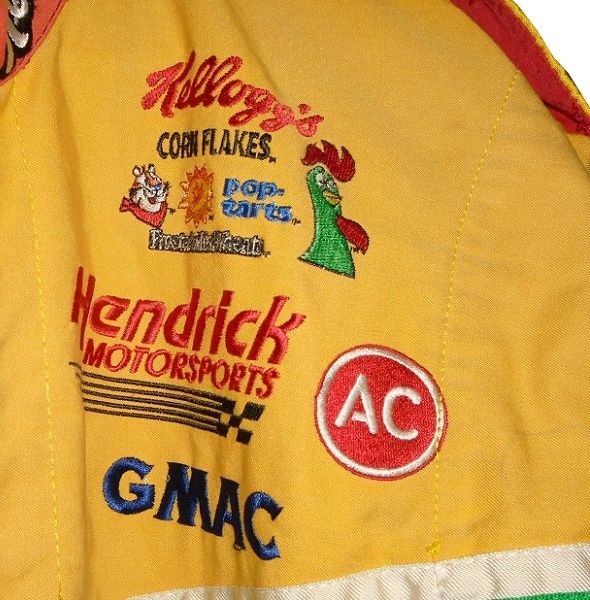 The left chest features KELLOGG’S CORN FLAKES, FROSTED FLAKES, RAISIN BRAN, POP TARTS, FRSOTED MINI WHEATS, HENDRICK MOTORSPORTS, AC DELCO, and GMAC logos embroidered into it. 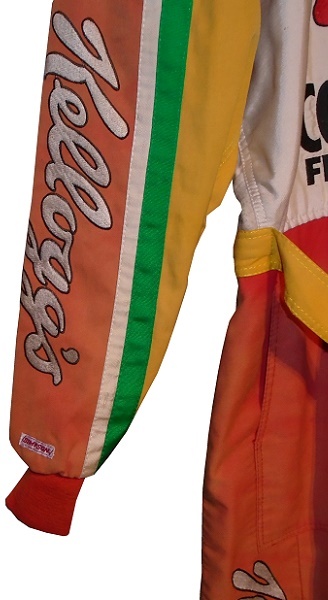 The front torso features a giant KELLOGG’S CORN FLAKES logo on a white background. 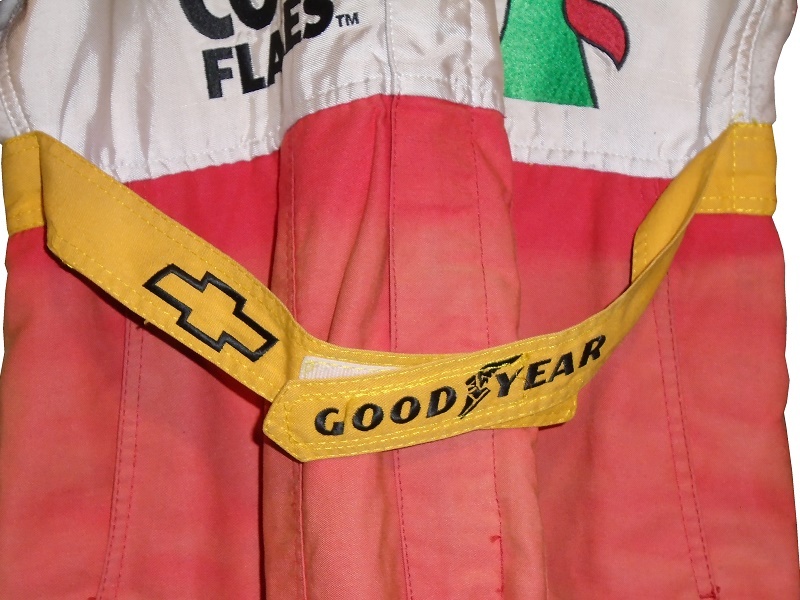 The yellow belt features a CHEVY bow-tie logo and a Goodyear logo embroidered into it. 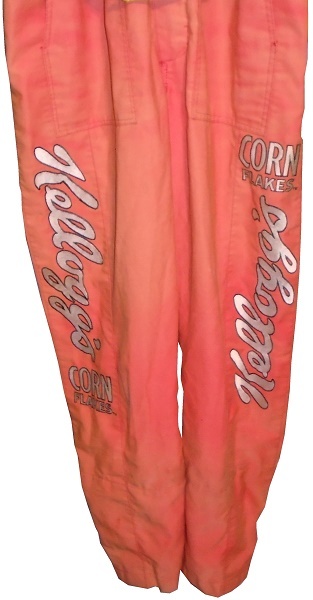 The faded red legs features KELLOGG’S logos in television position. 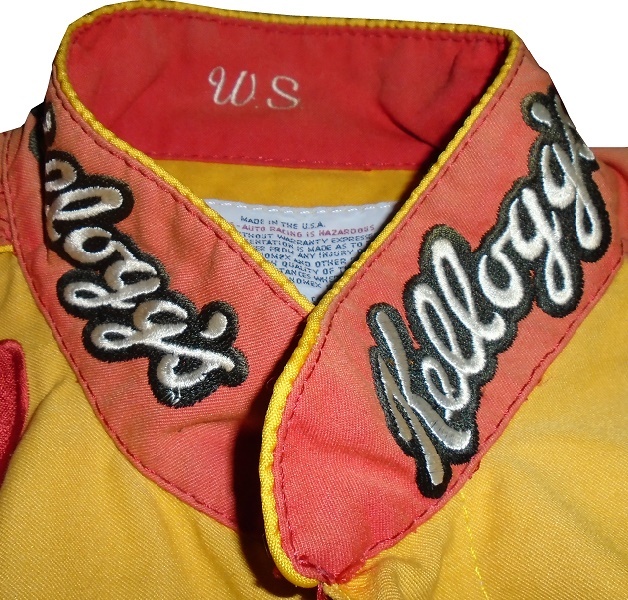 The faded red shoulder epaulets feature KELLOGG’S logos embroidered into them. 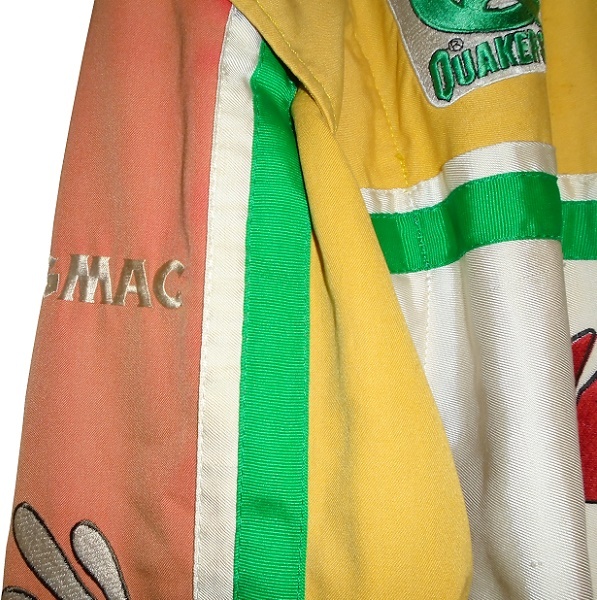 The right sleeve features a GMAC logo on the top and KELLOGG’S logos in television position on the faded red stripe. 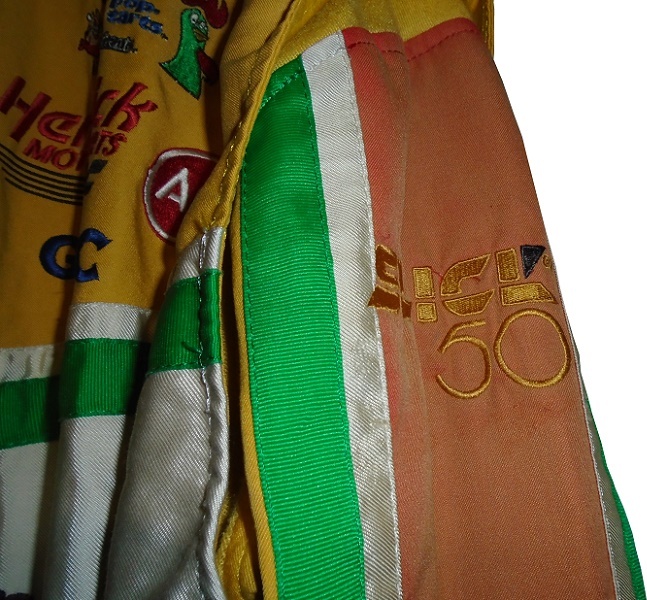 The left sleeve features a SLICK 50 logo on the top and KELLOGG’S logos in television position on the faded red stripe. The back of the suit shows some sun fading, and some light wear. The back of the neck is faded and unadorned. 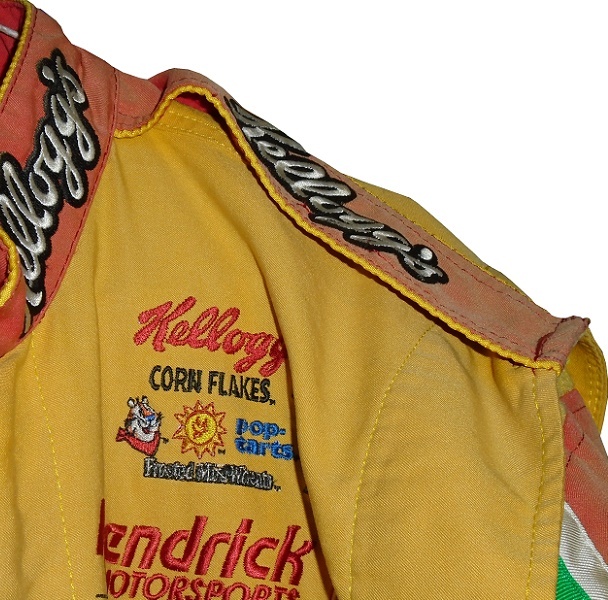 The back torso has a large KELLOGG’S CORN FLAKES logo embroidered. Terry Labonte is one of the most underrated drivers in NASCAR history. He was a contender for the 1979 Winston Cup Rookie of the Year, but lost to Dale Earnhardt. He is the second Triple Threat, having won in all 3 national series by 1995. He is also the first to win in all 3 series in the same year. He has also class wins in the Rolex 24, the 12 Hours of Sebring, and IROC. He is a championship winning driver who could win in many different classes. He is enjoying his retirement as a hall of famer. It would be cool if he ran one more race, but sadly, it probably won’t happen. Next week, a special project, which will be discussed on Tuesday.